Appropriate for Reef Aquariums w/ Soft Corals. 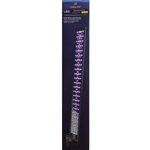 Consult the Reef Aquarium Lighting Chart to determine the best light for your aquarium. The Coralife Seascape 18-24" LED Light Fixture features energy efficient super bright LEDs for a flourishing aquatic ecosystem. The legs extend from 18" to 24" inches. 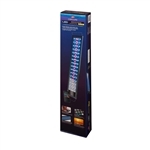 The RF remote control allows you to set a 24-hour timer for white, blue and RGB LED's individually. Choose between 8 preset colors for quick customization. Increase or decrease color intensity in 10% increments. Turn White, Blue or RGB LED's On/Off indiviudally and scroll through RBG colors in 3 different speeds. Automatic 30 minute ramp times for a gradual sunrise and sunset cycle. Includes RF remote control for the 24-hour timer. Batteries included. Can be used for freshwater or saltwater aquariums fish only aquariums. Also appropriate for medium light level plants and low light corals. The Coralife Seascape 30-36" LED Light Fixture features energy efficient super bright LEDs for a flourishing aquatic ecosystem. The legs extend from 30" to 36" inches. The Coralife Seascape 48-54" LED Light Fixture features energy efficient super bright LEDs for a flourishing aquatic ecosystem. The legs extend from 40" to 48" inches.